Founding KISS guitarist and Rock and Roll Hall Of Fame member ACE FREHLEY has released a new song today called "Rockin' With The Boys". 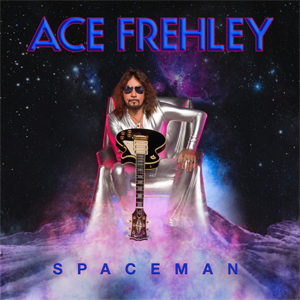 This is the second song Frehley has released this year, from his forthcoming all-new Spaceman album, due October 19, 2018, via Entertainment One (eOne). Frehley previously released the track "Bronx Boy" in April. “No need to worry, I’ll be home soon, ’cause I’m rockin’ with the boys,” Frehley sings on “Rockin’ With the Boys”, which tells the tales of life on the road. Ace says he wrote the original version of the song back in KISS’s heyday in the ’70s. Both "Rockin With The Boys" and "Bronx Boys" are available on all streaming platforms today, and are iTunes instant grat tracks for fans who preorder the album. Space Invader received praise from critics. Rolling Stone wrote, "Gene Simmons has claimed Ace Frehley doesn't deserve to wear KISS' Kabuki clown paint, but the former Spaceman's first solo LP in five years says otherwise," while Associated Press hailed, "...the original KISS lead guitarist has recorded his best solo album since his groundbreaking self-titled album in 1978."